Welcome to the Africa Gathering Movement and Thank you for supporting us. You too can join this movement to share ideas for positive change. Africa Gathering draws inspiration from the traditional, symbolic African Baobab tree: the place where people can gather to share knowledge, exchange ideas and learn from each other. Under AG’s tree all speaks openly, from activators to innovators, from artists to technologists. Under our tree we celebrate the change-makers and their work, we connect them to like-minded people, we share their passion for a positive Africa. Gathered under this tree, we bring African ideas and innovations to the rest of the world so that they can be recognised, used and celebrated. We provide an online and offline exchange forum that allows ordinary but amazingly talented African activators to champion their projects and concepts so that their achievements can be given exposure, gain momentum and attract interest from a global audience. We are passionate Africans looking to celebrate our continent’s human capital. We understand the needs of ordinary Africans. Africa is at the heart of everything we do. Under our Baobab tree, we bring together the new generation of social entrepreneurs, activators, investors and dream makers in one place so they can share their ideas, hopes and visions. Unlike other organisations we actively work to get results – rather than just muse about what we could do or pontificate about what we think should be done. We cross technical, social and ethnic divides by giving Africans a place to discuss their own ideas, rather than have someone speak on their behalf. 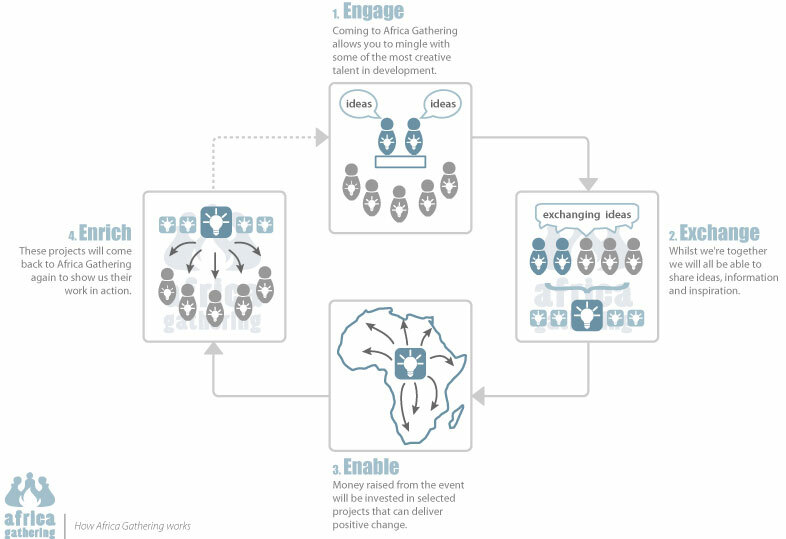 We work with enthusiastic and capable Africans on the ground to help us run our events and collaborate with African initiatives locally to spread the word about the continent’s best innovations. Why should you come to our gatherings? We are targeting everyone who believes that technology can help bring positive change, from big businesses to one-man outfits, educators to entrepreneurs, people who understand Africa and those who want to understand Africa better. Who should come to Africa Gathering? We are an inclusive platform and welcome all sort of people from bottom to top. If you’re an inventor/innovator – come and be inspired by other creative minds. Talk, learn and share. If you’re just interested – you’d be surprised at how much you can help by simply thinking about the ideas that are presented, making suggestions and feeling the atmosphere all helps. If you don’t come you’ll never know how you can fit in. .Strong health can be described as the condition where both our body as well as our mind are functioning in due course. On occasion medicines help us. Sure most pop preparation is Viagra. Have a question about Viagra or generic viagra review? Let’s find answers to certain questions about ED. Viagra is one of the best-known treatment options of all period. Probably generic viagra is a very complicated question. In the future it may be interesting to talk about Viagra. (Read more http://genericcialis-online.biz/generic-viagra.html). There are more than 200 common medicines can cause erectile dysfunction, including popular blood tension medicines, ache drugs, and specific antidepressants. No matter what erectile dysfunction treatment a man ultimately decides upon, experts say it’s significant to eat healthily.